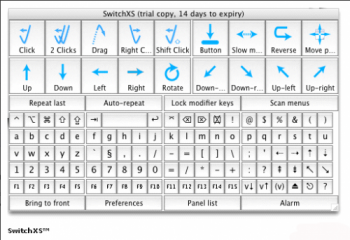 SwitchXS 2.5 - Scanning On-screen Keyboard and Mouse Emulation. 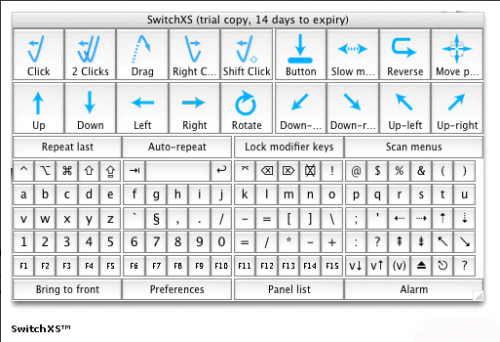 SwitchXS provides virtually complete access to Mac OS X and all standard Mac applications for people who can only use one or more switches. 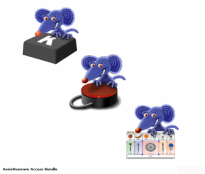 By using scanning, the software offers full mouse and keyboard emulation. With each click on the switch the user selects an action. What differentiates SwitchXS from switch adapted software is that with SwitchXS the user has full access to the computer and can, with a single switch or with two-switch-step-scanning, surf the web, edit videos in iMovie, compose emails in Mail or write, for example, an essay in Word. Included with SwitchXS are a number of predefined scanning panels that the user can choose from to move the mouse pointer, position the cursor, click, and type into all standard Mac applications. Panel editor, LayoutKitchen , is included so users can also create their own scan panels. SmartTransparency which makes the scanning panel partially or fully transparent when no scan is taking place to enjoy optimum use of screen real-estate. Swifty USB Switch Interface is an excellent companion product for SwitchXS users. SwitchXS users can have access to word prediction through KeyStrokes. This great combination can dramatically speed up typing while reducing effort.